Tumors are relatively common in dogs and overall they occur roughly twice as often in dogs as they do in people. Tumors that affect the nervous system occur regularly in both dogs and cats and can be considered under the subheadings of brain tumors and spinal tumors. Brain tumors in animals can cause a wide variety of clinical signs; the exact signs are dependent mainly on the location and to some extent the size of the tumor. Seizures are the most common clinical sign caused by brain tumors in dogs and cats. In fact brain tumors are the most common cause of seizures that develop after 5 years of age in any animal, although obviously there are a number of other possible causes of [intlink id=”1565″ type=”post”]seizures[/intlink]. Diagnosis of brain tumors depends initially on a good neurological examination followed by intracranial imaging using either a CT scan or an MRI. Definitive diagnosis depends on obtaining a tissue sample of the suspected tumor, which can often be done safely using a fine needle. Biopsy of suspected tumors is particularly important because in humans up to 21% turn out not to actually be tumors at all when examined under the microscope. In 8 of 50 dogs (16%) undergoing brain biopsy, the biopsy result changed the diagnosis and treatment dramatically. In four dogs there was no tumor present and they were all alive and well up to two years later. The treatment and prognosis for brain tumors vary with the type of tumor. The most common type of brain tumor in dogs and cats is the meningioma. This is a relatively benign tumor type although in practice, much like many other types of tumor, meningiomas can be somewhat variable in their biologic behavior. Some canine meningiomas are almost totally benign and do not tend to recur after surgical removal whereas occasionally they are highly malignant and recur quickly. However, most canine meningiomas have somewhat intermediate characteristics and so benefit from additional treatment measures such as radiation or chemotherapy. Feline meningiomas are usually more benign than those that occur in dogs and many cats do very well after surgical removal without any additional therapies like chemotherapy or radiation. Other tumor types in dogs and cats are less responsive to therapy and the prognosis is in general more guarded. Figure 13-1: A: Dog that has a tumor at the base of the brain (arrow). The tumor has enhanced after administration of a magnetic contrast agent. B: Image from a normal dog as a comparison to A. The prognosis is guarded for most animals with brain tumors but this obviously varies with the specific tumor type (see above). The main complication after surgery is tumor recurrence. Clinical signs associated with brain tumors in dogs: 97 cases (1992-1997). Bagley RS, Gavin PR, Moore MP, Silver GM, Harrington ML, Connors RL. J Am Vet Med Assoc. 1999 Sep 15;215(6):818-9. Retrospective review of 50 canine intracranial tumors evaluated by magnetic resonance imaging. Kraft SL, Gavin PR, DeHaan C, Moore M, Wendling LR, Leathers CW. J Vet Intern Med. 1997 Jul-Aug;11(4):218-25. Comparison of fine-needle aspiration and surgical-tissue biopsy in the diagnosis of canine brain tumors. Platt SR, Alleman AR, Lanz OI, Chrisman CL. Vet Surg. 2002 Jan-Feb;31(1):65-9. Primary irradiation of canine intracranial masses. Spugnini EP, Thrall DE, Price GS, Sharp NJ, Munana K, Page RL. Vet Radiol Ultrasound. 2000 Jul-Aug;41(4):377-80. Surgery alone or in combination with radiation therapy for treatment of intracranial meningiomas in dogs: 31 cases (1989-2002). Axlund TW, McGlasson ML, Smith AN. J Am Vet Med Assoc. 2002 Dec 1;221(11):1597-600. Prognosis after surgical excision of cerebral meningiomas in cats: 17 cases (1986-1992). Gallagher JG, Berg J, Knowles KE, Williams LL, Bronson RT. J Am Vet Med Assoc. 1993 Nov 15;203(10):1437-40. CT-guided brain biopsy using a modified Pelorus Mark III stereotactic system: experience with 50 dogs. Koblik PD, LeCouteur RA, Higgins RJ, Bollen AW, Vernau KM, Kortz GD, Ilkiw JE. Vet Radiol Ultrasound. 1999 Sep-Oct;40(5):434-40. Importance of image-guided stereotactic biopsy to confirm diagnosis in an oncological setting. Arbit E, Galicich JH. Ann Surg Oncol. 1994 Sep;1(5):368-72. Tumors that affect the spinal cord can either originate from the spinal cord itself or from the surrounding structures such as bone. Spinal tumors often cause pain and rapidly progressive neurological deficits. Diagnosis depends initially on imaging by myelography or preferably using either a CT scan or an MRI. Obtaining tumor cells to look at under the microscope is necessary in order to be sure that there is not another cause for the animals signs such as a disc herniation. The most common spinal tumor is a malignant sarcoma that usually arises from bone or fibrous tissues of the spine. These tumors are difficult to treat unless they are identified before they cause too much destruction of tissues. It may be possible to remove a small tumor along with the entire affected vertebra with the potential for a complete cure. Meningiomas of the spine can also have a good outcome after surgical removal. The spinal tumors with the best outcome are plasma cell tumors (also known as myelomas) and lymphomas. These often respond very well to mild types of chemotherapy and, in the case of plasma cell tumors, affected dogs can then survive for several years. Figure 13-2: Dog with a type of spinal tumor called a plasma cell tumor. A: CT scan through an unaffected vertebra adjacent to the area shown in image B. Note the density of the bone, which shows up as white in these scans, in particular the region surrounding the spinal cord (arrowheads). The spinal cord is bean-shaped and is visible clearly because it is outlined by a myelographic contrast agent mixed with the spinal fluid (arrow). B: CT scan through the vertebra affected by the tumor. There is a marked, general loss of bone density, especially in the region surrounding the spinal cord (arrowheads). The spinal cord itself is also compressed severely and the surrounding spinal fluid and contrast is hardly visible at all (arrow). This dog responded very well to mild chemotherapy and is still alive with no neurological problems six months later. The prognosis is good for animals with plasma cell tumors but guarded for those with other types of spinal tumors, although this obviously varies with the specific tumor type (see above). The main complication after surgery is tumor recurrence. Spinal Cord Tumors. REQUIRES LOGIN; FOR VETERINARIANS In Braund’s Clinical Neurology in Small Animals: Localization, Diagnosis and Treatment. C.H. Vite (ed). 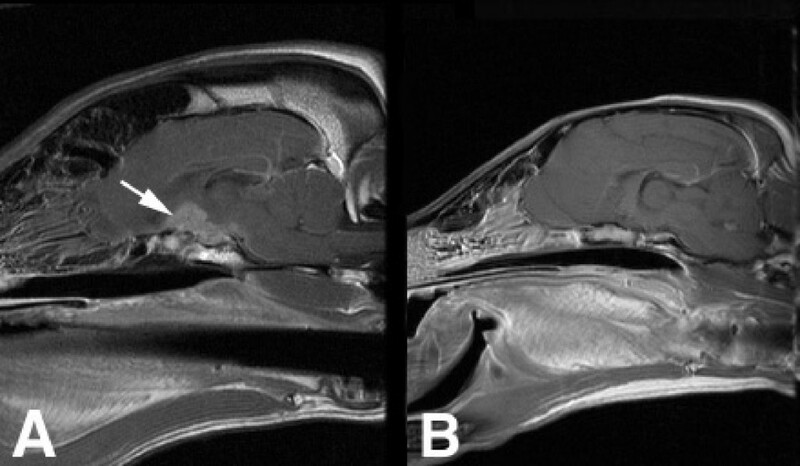 Magnetic resonance imaging features of tumors of the spine and spinal cord in dogs. Kippenes H, Gavin PR, Bagley RS, Silver GM, Tucker RL, Sande RD. Vet Radiol Ultrasound. 1999 Nov-Dec;40(6):627-33. Spinal meningiomas in dogs: 13 cases (1972-1987). Fingeroth JM, Prata RG, Patnaik AK. J Am Vet Med Assoc. 1987;191(6):720-6. Vertebral plasma cell tumors in 8 dogs. Rusbridge C, Wheeler SJ, Lamb CR, Page RL, Carmichael S, Brearley MJ, Bjornson AP. J Vet Intern Med. 1999;13(2):126-33.